See Accredited Adviser In Insurance. See American Association of Individual Investors. See American Association of Insurance Services. See Association of Advanced Life Underwriting. A type of trust used in the estate planning of married couples in order to take full advantage of the individual estate tax credit and the unlimited marital deduction. The A trust is a form of the marital trust. The B trust is a form of the credit equivalent bypass trust. The irrevocable transfer of the ownership and control of property, including a life insurance policy, to a third party, or the assignee. The assignee becomes the new owner. The premises that a person or organization will be held liable in specific circumstances, regardless of whether that person or organization has been negligent. For example, an employer is generally held liable for paying workers compensation benefits for injuries that employee sustains while working for that employer regardless of how the injuries were caused or who may have been negligent. An event that is unforeseen, unexpected, out of the control of the insured and that results in a loss. A form of insurance where a benefit is paid upon the death of the insured when the cause of death is from accidental means or in the event of an accidental bodily injury (e.g., loss of an arm). Life insurance policies can contain a rider that pays an additional death benefit to the beneficiary in the event that the insured's death occurs as the result of an accident. The recording of the business transactions and organizing these records into usable data for analysis and control of the business. The amount in a cash value life insurance policy that earns interest. When the surrender charge is deducted from the account value, the remainder is the cash surrender value. This insurance covers a business that is unable to collect on accounts receivables due to records being destroyed by an insured peril. A professional designation of the Insurance Institute of America (IIA) that is earned after the successful completion of three national examinations. The time period during which annuity premiums are received by the insurance company. At the end of this accumulation period the annuity is annuitized and the distribution phase begins. A mechanism that is used to account for the deposits and earnings of a variable life policy or variable annuity contract. See American Council of Life Insurance. Natural occurrences such as hurricanes or earthquakes that are beyond the control of humans. A provision of many group insurance contracts. The provision states that coverage will not begin on an employee that is absent from work until that employee returns to work, if the employee is absent for medical or other specified reasons, on the day coverage begins. A list of activities, which are used to assess the degree of an insured's impairment and determine eligibility for certain insurance benefits (e.g., Long Term Care benefits). These activities may include mobility, dressing, bathing, toileting, transferring and eating. A method of calculating the annual contribution to be made to a defined benefit plan by the plan sponsor. A professional trained in the technical aspects of pensions, insurance and related fields that is employed to calculate premiums, reserves, dividends, and premium rates. These calculations are based on both the company's history of claims and other industry and general statistical data. The costs associated with placing new insurance business on the insurance company's books. These costs include the commissions, underwriting expenses and marketing expenses. A clause that is common in property insurance contracts that set the cost of replacing covered property with comparable new property, minus an adjustment for depreciation and obsolescence. Medical treatment for a serious illness or injury that requires immediate care. This treatment is usually provided on a short-term basis in a hospital or a skilled nursing facility and may be contrasted with chronic care. See Accidental Death & Dismemberment Insurance. A type of preferred stock that is issued with an adjustable dividend rate. The rate is generally tied to some other rate, such as Treasury Bills or other money market vehicles, and can be changed as often as quarterly. Prices of adjustable rate preferred stocks are usually less volatile than fixed rate issues. An individual that represents a property and casualty insurance company to determine the amount of a loss and settle the claim on behalf of the carrier. The individual that is named by the court to settle an estate. The court will appoint an administrator if there is not an executor named in the will, if the executor named in the will does not qualify or if the named executor is unable or unwilling to serve. An arrangement under which an insurance carrier, its subsidiary or an independent organization will handle the administration of claims, benefits, reporting and other administrative functions for a self-insured plan. The assets of an insurance company that are permitted by state law to be included in the annual statement. An insurance company that is licensed to write policies in a given state. An insurance company that has been licensed by a state to conduct reinsurance business in that state. The process of determining life insurance needs for complex business insurance, tax planning, estate planning and personal situations. Premiums paid by the policy owner prior to the premium due date. For paying the premiums in advance, the insurance company offers a discount. The tendency of individuals with poorer-than-average health to apply for or continue insurance coverage to a greater extent than individuals with average health. A child that is born after the parents execute their will. An insurance marketing systems where an insurance company uses their own commissioned agents. This very common system is also known as the ordinary agency system. There are two forms of this system: the branch office distribution system and the general agency distribution system. An insurance salesperson that is licensed by the state to represent an insurance company. A reinsurance company that has been formed by an insurance company and is owned by a group of agents. Business that is written by the agent-owners is reinsured by the AORC allowing the agents to share in the profitability of their business. The portion of the insurance application in which the agent records information about the proposed insured that is not included on the application. For property damage, liability or health insurance policies this represents the maximum dollar amount of coverage available under a policy. This amount may be on a single occurrence basis or may be for the life of the policy. A category of mutual fund with an objective that seeks maximum appreciation or capital gains with little or no consideration for dividend income. This category includes stocks of rapidly growing companies and is generally more volatile than the overall stock market. See American Insurance Association . See American Institute for Property and Casualty Underwriters . A corporation that is not incorporated under the laws of United States. An insurance company that is formed in a foreign country. The company must conform to the rules and regulations of any state in which it wishes to do business in. A measure of the contribution that a portfolio manager makes to the performance of an investment portfolio, i.e., performance over and above that which can be attributed to general market performance. If the alpha is positive, it points to evidence of superior performance. If the alpha is negative, there is evidence of inferior performance. If the alpha hovers around zero, it shows that the portfolio manager has matched the market. A professional association of actuaries located in Chicago who sets standards of performance for those engaged in actuarial functions. Members are entitled to use the professional designation of MAAA. Also see the American Academy of Actuaries Home Page. An independent, not-for-profit corporation formed in 1978 for the purpose of assisting individuals in becoming effective managers of their own assets through programs of education, information and research. Also see the AAII Home Page. The AAIS is an independent advisory organization of the property and liability insurance industry that among other things provides and develops policy forms for its member companies. Also see the AAIS Home Page. The American College is the accreditation body for both the Chartered Life Underwriter (CLU) and the Chartered Financial Consultant (ChFC) designation. The college provides undergraduate, graduate and continuing education courses for the life insurance industry. Also see The American College Home Page. The council is an association of life insurance companies that focuses on legislation and public relation issues that may affect the life insurance business on Federal, state and local levels. Information on the life insurance industry is also maintained for public distribution. Also see The American Council of Life Insurance Home Page. A negotiable security that represents a receipt for a number of shares of stock of a foreign-based corporation. A foreign branch of a large commercial U.S. bank issues the receipts. A custodian, generally a bank in the home country of the issuer, holds the foreign shares. The ADR's are traded in U.S. securities markets making the ownership of foreign securities more accessible. An organization that establishes educational standards for the property and casualty underwriting profession. Upon completion of the appropriate training, education and examination requirements the candidate is recognized by the granting of the Chartered Property Casualty Underwriter (CPCU) designation. Also see the AIPCU Home Page. A trade and service organization of property and casualty companies which serves as a forum to discuss industry issues. Also provides investigative services and a means to review safety topics. The ARIA is a professional association for insurance scholars and risk management professionals. Also see the ARIA Home Page. A stock exchange that for the most part, trades the stocks and bonds of medium-size companies. The reduction of a debt through periodic repayments of interest and principal sufficient to pay off a loan by maturity. In accounting, amortization gradually reduces the cost value of a limited life or intangible asset through periodic charges to income. A policy form of term life insurance that provides one year of coverage. At the end of the one-year period, the policy may be renewed at the discretion of the policy owner for another one-year period. The premiums on the new policy will be increased to reflect the fact that the age of the insured has also increased by one year. A report that is filed annually with the Internal Revenue Service and details the membership and financial information of participants in a qualified pension plan. A financial statement that each insurance company must file annually with the Commissioner of Insurance of each state in which they are admitted to do business. The statement is prepared in accordance with statutory accounting principals in a form agreed upon by the National Association of Insurance Commissioners (NAIC). Also referred to as the Convention Blank. A method of commission payment where the full annual first-year commission is paid to the agent when the policy is issued regardless of the premium payment mode. Generally commissions are paid as premiums are collected. The person who benefit payments for the annuity are based and who receives or will receive the income benefit from an annuity. The change of a deferred annuity from the accumulation phase to the distribution phase in which the income benefit begins to be paid. A series of periodic payments payable for either a defined period or based on either a single life or a joint life expectancy or both. A contract sold by insurance companies that pays an income benefit for a specified period of time. The period can be specified as a number of years, the life of one individual or the lives of two individuals. There are a number of variations of the method that payments are made by owners during the accumulation period, and the method that the benefits are paid by the insurance company during the liquidation period. An annuity that pays a benefit for a specified period of time even if the annuitant dies during the period. The payments that are made to the insurance company for the purchase of an annuity. These payments may be a single payment or a series of payments made over time. A series of payments of equal amounts paid at the beginning of each period. The periods may be monthly, quarterly or annually. The individual that is applying for the insurance policy. This individual in not necessarily the owner of the policy or the insured. A written form that is completed about the proposed insured, policy owner, beneficiaries and contains information on the health of the proposed insured, reason for the insurance and other information needed for the underwriting process and to issue the policy. Note: Falsification or nondisclosure of information may give the insurance company grounds for rescinding a policy that has been issued. A dividend option that uses the policy dividends to reduce the premium payment. The increase in value of an asset or investment. A process where two parties who are not able to agree on a contract settlement submit the disagreement to an independent person or persons to resolve the disagreement. The arbitration process is binding on both parties and is an alternative to suing in court to settle disputes. See Associate in Risk Management. The last or closing price at which someone offered to sell a given security. Also see Bid Price. The value of property and resources owned by a person or corporation. The way investments are allocated (distributed and weighted) among different types of investment vehicles. The objective of asset allocation is to diversify risk while obtaining the greatest possible return consistent with the investor's risk tolerance. An investment technique where the investor periodically reallocates investments within a portfolio to maintain the original asset allocation. Also referred to as an Irrevocable Life Insurance Trust, an Asset Replacement Trust is usually set up along with a Charitable Remainder Trust. Income from the Charitable Remainder Trust is used to pay the premiums on a life insurance policy on the life of the donor. Following the donor's death, the proceeds of the policy go to the beneficiary (usually the spouse and or children) and are not taxable as part of the donor's estate. The person or entity that receives the contractual rights under an assignment. See automobile assigned risk plans. The payment of the benefits directly to a medical provider (e.g., physician or dentist) under a health insurance policy. The person or entity that transfers the contractual rights under an assignment. A professional designation that is granted after the successful completion of three national examinations given by the Insurance Institute of America. The course of study covers the essentials of risk management, risk control and risk financing from both the insurance company and corporate perspective. A life insurance organization established in 1956 for the purpose of representing the insurance agents and dealing with the U.S. Treasury and Congress on issues related to taxation and other legislative matters. The AALU has become a council of the NAIFA. Also see AALU Home Page. An organization whose mission is to sustain and improve the business environment for insurance agents that provide health insurance products and services, to enhance their professional skills and to improve the financing and delivery of health care in the United States. Also see the AHIA Home Page. A form of reinsurance where another insurance company assumes a block of business in its entirety. The effect is to transfer the risk from one insurance company to another. The age of an insured at a particular point in time. A statement prepared by the physician or other medical professional of the proposed insured. 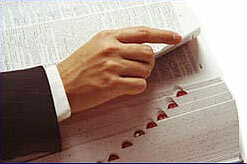 It contains information related to the treatment of the proposed insured. This statement is used in the underwriting process for life or health insurance policies. A provision in a disability income policy that increases the policy's monthly benefit on an annual basis without the insured providing evidence of insurability. A reinsurance agreement (treaty) that provides for the automatic reinsurance of policies that are within certain defined limits. Under this type of treaty the insurance company must transfer the risk and the reinsurer must accept this transfer. Also see facultative reinsurance. Automobile insurance that covers individuals who are unable to obtain conventional automobile liability insurance, generally due to a poor driving record. These individuals are assigned to the insurance companies to write the policy, at a higher rate. The assignments are made in proportion to the premiums written by the company in that particular state. A common provision in life insurance and accidental death policies that excludes deaths in plane crashes unless the insured is a passenger on a regularly scheduled airline. In dividuals that fly private plans can get a rider (for an extra premium) on their life policy that will cover them from this risk.